The Industrial Assessment Center (IAC) at West Virginia University has been in existence with funded support from the U.S. Department of Energy (DOE) since 1992. Based on its assessments, insulation is a highly recommended opportunity for energy savings. In fact, per the IAC database, insulation is one of the top ten recommendations to industrial facilities. It is interesting to examine the insulation recommendations for manufacturing companies across various Standard Industrial Codes (SICs) with respect to corresponding energy and cost savings. Instruments such as handheld infrared temperature measurement guns and digital thermal imaging equipment were used for these recommendations. In addition, the DOE’s recommended BestPractices software tool, as well as 3E Plus® and fundamental engineering principles were applied to estimate the energy and cost savings. Figure 1 shows the digital and thermal image of a boiler surface. The thermal image reveals that the center part of the boiler surface is extremely hot—with a temperature of more than 500°F—while most of the surface temperature is in the range of 250° to 300°F. Most manufacturing facilities recognize the benefits of proper insulation on hot and cold surfaces and pipes, yet others neglect this important aspect. These facilities’ intense focus on fulfilling production targets leaves little time to investigate energy losses due to lack of insulation. The general description and the SICs for some of the manufacturing facilities visited by the IAC are shown in Figure 2. The average amount of annual recommended energy savings among the manufacturing sector showcased in Figure 2 is shown in Figure 3. Close to 64 percent of the total recommended energy savings from insulation projects was realized in terms of natural gas equipment surfaces and/or distribution lines, followed by sawdust systems (with 24-percent savings). Insulation of electrical systems contributed to 7 to 8 percent of the total recommended savings. Coal and other fuels together had less than 5 percent of the total savings. Based on this analysis, it is evident that natural gas systems (such as boiler surfaces and steam distribution lines) have high potential for effective insulation and should receive adequate attention for insulation projects. 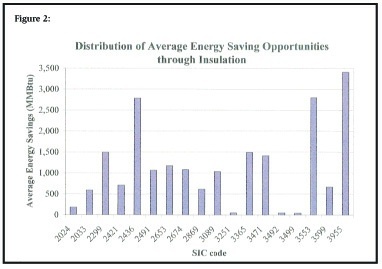 Manufacturing facilities with SICs 3955, 3553, and 2436 had the highest energy-saving opportunities from insulation projects (see Figure 2). 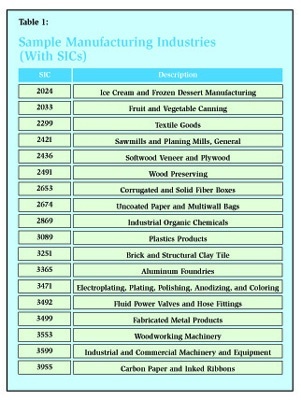 SIC 3955 is carbon paper and inked ribbons manufacturing, while SICs 3553 and 2436 are both related to wood-manufacturing industries. An analysis of the energy-saving recommendations reveals that the ones that were related to SIC 3955 involved insulating the coating machines. The uninsulated machine surfaces were losing significant heat energy. The amount of energy lost through the surfaces was close to 20 percent of the total energy used by the plant. After insulating the surface with proper material, the plant was able to reduce its energy cost by approximately $25,000 per year. As an example, one of the vertical surfaces that needed insulation had a temperature of 260°F. The surrounding temperature was measured at 70°F, and the maximum allowed temperature was assumed to be 140°F. Since this was an indoor area, the wind speed was assumed to be 0 miles per hour (mph). Based on this information, 3E Plus software (see Figure 3) was used to estimate the amount of energy loss before and after the insulation. As shown in Figure 4, after adding 1 inch of 450F M F BOARD ASTM C612-00a T1B insulation material, the heat loss reduced from 451.7 British thermal units per hour per square foot (Btus/hr/sf) to 45.5 Btus/hr/sf. Therefore, the total savings from insulating the surface is 273 million British thermal units (MMBtus) per year. Similar analysis was performed to quantify the recommended energy savings from insulating all of the surfaces identified. One of the companies under SIC 3553 had recommendations related to insulation of steam distribution lines and dock doors. The total savings from the two insulation recommendations resulted in savings of approximately 8 percent of the total natural gas cost per year. 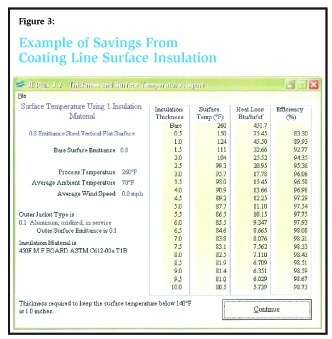 Similar savings from insulation improvements were recommended for other companies. In most cases, the insulation recommendations were related to steam distribution lines, boiler surfaces, dock doors, and ovens. Energy-saving opportunities not only reduce a company’s operating cost, but also reduce the amount of carbon dioxide (CO2) emissions (approximately 113 pounds per MMBtu of natural gas usage reduction). This makes a company competitive and environmentally efficient at the same time. The cost of implementing the recommendations also was considered and was estimated to result in an average simple payback period on investment of fewer than 6 months. In only a few facilities was the simple payback period on investment more than 1 year. Because of the low implementation cost, simple implementation procedures, and significant cost savings, the insulation recommendations have proven to be attractive for facilities to implement, resulting in an implementation rate close to 70 percent.